Why should we choose Italy as our destination wedding? Italy is a great country which offers a wide variety of romantic backdrops for your big day. From the magic atmosphere of Como lake, to the natural and relaxing vibe of Tuscan hills, with olive trees fields and vineyards, to the breathtaking cliffs of Amalfi coast, to the unique Venice, one of the most romantic cities in the world. Along with the incomparable surroundings, Italy will also guarantee amazing food and excellent wines, for a reception which will be unforgettable. When is the best time to have a wedding in Italy? Anytime from April to October is the best time if you are looking for mild Italian weather, but December and January will be the best choice if you love mountains and winter atmosphere. Italy is a very tough country on the bureaucratic side. If you are looking for a civil or religious ceremony, we suggest doing it only with the help of a professional. There might be a misleading idea of the wedding planner as a luxury treat for a wedding, which in the case of destination wedding is absolutely untrue. We receive a lot of last minute requests from couples who have tried to go through the process themselves and have issues with paperwork, made mistakes with documents and so on. Most Italian townhall officers don’t speak English very well which can lead to misunderstandings. We can guide you through the bureaucratic process to ensure everything is turned in on time and on point. Why book with Italian Wedding Designer? We are a passionate and good humoured team. We are all high energy and hopelessly romantic people, that work with enthusiasm, and with the only task to make your wedding unforgettable and relaxing, not only for you but also for your family and friends. We have great relationships with all the vendors, caterers, florists and so on, as we have been in the business for quite long time, and vendors which have worked with us easily recommend us to couples that contact them looking for a planner. We keep updated with annual workshops on paperwork and all that is related to the latest news in the destination wedding business. We are part of the Tuscan Wedding Network, that includes the highest-quality vendors and planners renowned in the Tuscan area. Italian Wedding Designer was born in 2011, but we all have previous personal experience in the business (such as event manager, tourism, graphic designers and so on) since at least 2006. Where do you do Weddings? We are very lucky because we live and work in a wonderful country, with ancient cities, very different natural scenery, good weather and the best food and wine. There is the perfect place for everyone in Italy, and on our side, due mainly to logistical reasons, our most popular areas are Tuscany, Como Lake, Venice and Amalfi Coast. How many wedding do you plan in a year? Every Event manager in our team will plan maximum 10 weddings per year, and not more than one per week, to be able to guarantee a complete presence during the days before the wedding and during the planning process. We are focused on quality more than quantity. What does a wedding planner do during the planning process? To start the planning process, our wedding planner will need information on your wedding size and budget, and will set up a skype call to meet with you and understand your expectations and needs. After this step, the wedding planner will be able to start the venue research based on your request. The planner will be charged with finding vendors and keeping in contact with them, being the middleman between you and the vendors, to guarantee that the agreements fulfil both parts. The planner will create a timeline for the planning and a file to keep the budget under control, keeping in mind your needs in order to give you all the information to help you plan your wedding in a relaxed mood. What is the hardest thing to handle as a wedding planner? The most though thing to handle is when couples have a hard time making decisions and don’t trust our experience or vendors’ expertise. Luckily this doesn’t happen often, and we always try to reassure our clients that they can rely on us and on vendors, as our main task is to make their wedding great and make them happy. Is the wedding coordinator there from the beginning to the end of the wedding? The wedding planner will be there the whole time during the wedding, to track the set up and dismantle of the event, coordinating all the vendors, checking that every detail is delivered as agreed, and being ready to face unexpected last-minute changes or issues. The wedding planner will of course also take care of the couple and guide the guests to make sure the wedding goes on smoothly and on time. We only do customised packages, where all the vendors are chosen by the couple. We suggest vendors which fit the couple’s needs, budget and style, explaining each vendor’s policy. Clients will choose between the proposed figures their favourite, sign a contract with them and directly pay them. Our agency packages include our assistance, so the whole planning and coordination process from vendor selection to the event day coordination. We prefer to offer an all-inclusive package, but we are also open to other types of agreements. We are also able to provide a Design package, which is on top of the planning package, that includes save the date, invitations, menu, place cards and all the other customised stationery a wedding requires. How do you design and print our stationery? We have an internal graphics department. Our designer will ask your preferences and inspirational mood boards, and then we will send you drafts based on your guidelines, making a customised and matching stationery. We can then print and send you save the date, invitations, thank you cards, but printing and shipping price is not included in our package as it depends on your choice of printing method, paper, envelopes, sizes and quantities. Can we add design package after we signed the contract? Sure, you can add the design package even in the following months, based on our graphic team’s availability and the project’s deadline. Our fees are calculated based on paperwork process complexity, if it is a religious or civil ceremony, the wedding size and demands of the event, wedding related events to plan and coordinate, number of team members to involve. Our fees are all-inclusive, with no hidden costs. All charges are specified in our package/contract. Is a civil marriage legal in our country? Of course it is. We can help you with the necessary paperwork to have your legal civil ceremony in Italy, and afterwards we will deliver to you the translated and legal wedding certificate which you can use to register the wedding in your country. How much does a wedding in Italy cost? Why do you have to know my budget on our first consultation? We ask for the budget because it is a very important information towards the planning process. We don’t ask for that to be impolite or to make you spend more money. We need to understand if your budget is realistic and to understand what is your ideal wedding budget distribution, to be able to suggest a venue which fits the budget, taking into account all the other expenses you will encounter in the planning process. How do payment terms work? We ask for a deposit at the signing of the contract to guarantee our assistance and block the date. We request a second deposit on February 15th and the balance 20 days before the event. Payments can be made via bank transfer, Revolut or PayPal (adding 5%). Will the planner who is working with me throughout the planning process attend the wedding day? The wedding planner will follow the whole back office and planning of the event, being the referent for the couple, will be the head coordinator on the wedding day, and will direct the eventual additional coordinators. In our package, we also include a prior meeting before the wedding to finalise all the last details before the wedding to ensure the bride and groom have a fully relaxed wedding day. We can be contacted by email every day. We can also be reached via skype or phone call, but we have to schedule the call in advance to guarantee our availability. Many clients, in the beginning, do not have a clear idea of Italian services price. For foreign people it can be tricky to understand that price will have to include a VAT tax, that can vary from 10% to 22%. It is due to all the services which take place within the Italian territory. Another compulsory Italian tax is SIAE, that must be payed to be allowed to play music for a group of people. It is a very important permit, that is due whenever music is played for a group of people. Average amount is 346€, and is based on a party’s number of guests, venue area, type of event and type of music. Another thing to keep in mind is that depending on your country, you might be charged for each bank transfer, which is the only way to pay the deposit and balance to confirm most vendors (a few of them also accept PayPal payments), so remember to add it to the expenses list. When coming to Italy there is a maximum of cash transport of 9.999,00 € euro per person, in any case it is not possible to pay cash for amounts over 3.000,00 €. 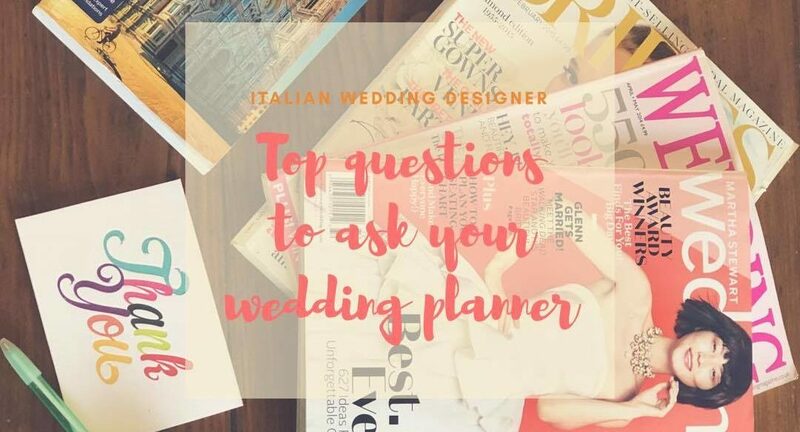 If you have some other questions to ask your wedding planner don’t hesitate to write us!